Gantt Chart is a classic project management tool used by most of professional project managers. Impressively functional Gantt Chart allows you to plan, track, analyze, manage scope, schedule and budget of your project professionally. Gantt Chart is accompanied by a tasks table, thus there is a possibility to edit tasks on the chart as well as in the task table. With viProject you can easily manage your resources. Two types of resources can be input – People & Equipment and Materials. Resource Calendars allow to custom calendars for individual project resources. Resource Tracking is available for Actual and Remaining Costs or Work for project resources. Project planning and Performance control features help you to keep things under control: Work Breakdown Structure: allows to organize the hierarchy of project tasks. Critical Path: is calculated once the tasks in the project are changed. Task Editing: project tasks can be edited in the Task Table, Gantt Chart or in the Task Inspector. Task Links: from the finish-to-start (FS), from the finish-to-finish (FF), from the start-to-finish (SF) and from the start-to-start (SS). viProject2 calculates costs of Tasks, Resources, Assignments and the whole Project. There are three cost accrual types: at the Start, Prorated and at the End. Task Costs: it is also possible to assign additional Fixed Costs to each task. We have put a significant amount of our efforts into usability and functionality of the viProjects’ Gantt Chart to ease the work of project managers. viProjects’ Gantt Chart is interactive, quick to respond, smooth and user friendly. It comes with smooth timeline scaling and scrolling using gestures.  The impressively functional Gantt Chart allows you to plan, track, analyze, manage scope, schedule & budget of your project professionally.  Gantt Chart is accompanied by a tasks table, thus there is a possibility to edit tasks on the chart as well as in the tasks table. 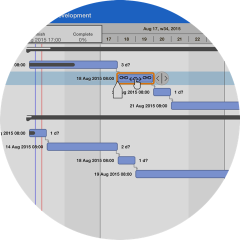  Gantt Chart is a classic project management tool used by most of professional project managers.  Work Breakdown Structure: to organize the hierarchy of project tasks.  Critical Path: viProject2 automatically calculates a Critical Path as change tasks in the project are changed.  Task Editing: project tasks editing in a Task Table, a Gantt Chart or in a Task Inspector.  Task Links: finish-to-start (FS), finish-to-finish (FF), start-to-finish (SF) and start-to-start (SS).  Resource Types: two types of resources – People & Equipment and Materials.  Resource Calendars: to custom calendars for individual project resources.  Resource Tracking: for Actual and Remaining Costs or Work for project resources.  Cost Calculation: viProject2 calculates costs of Tasks, Resources, Assignments and whole Project.  Three cost accrual types: At Start, Prorated and At End. We have put significant amount of our efforts into usability and functionality of the viProject2 Gantt Chart to ease project managers work. viProject2 Gantt Chart is interactive, quick to respond, smooth and user friendly. It comes with smooth timeline scaling and scrolling using gestures. viProject lets users keep under control project performance and costs. viProject2 would not cost you a fortunate. It’s absolutely FREE to download and use for unlimited period of time. Even more – All monthly updates are FREE too!